Anytime a rookie comes out the gate in a strong manner, collectors take notice. When a rookie for the New York Yankees does it, everyone takes notice. A record-setting start for Gary Sanchez has fans and collectors showing considerable interest in the young star. 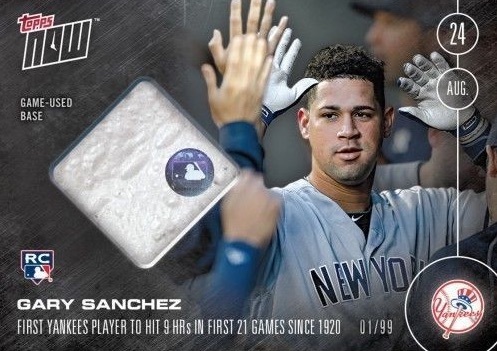 This has resulted in huge demand for Gary Sanchez baseball cards. See his full rookie card guide below along with his key prospects. 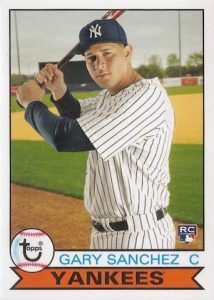 Born in the Dominican Republic, Gary Sanchez signed with the Yankees in 2009 as a free agent and worked his way through the minor leagues over several years. His major league debut came in October of 2015 but his breakout took place in August of the following season. During a ridiculous 2016 stretch, he became the first player to ever total 11 home runs and 31 hits in his first 23 career games. He was also named back-to-back AL Player of the Week, the only time this has ever happened for a rookie. Sanchez later pushed that modern-era record to the most home runs in a player's first 45 games with 19 dingers. 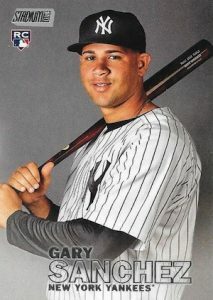 Shop for Gary Sanchez baseball cards on eBay. 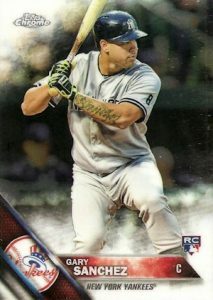 Although it took a few years for Gary Sanchez to truly showcase his MLB talent, collectors have been able to find his cards since 2010. These earliest prospects remain some of his most popular, especially the signed versions. 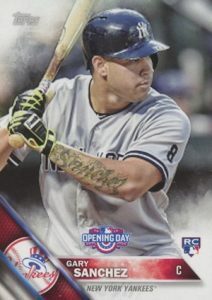 Despite his late-season debut in 2015, official Gary Sanchez rookie cards were not available until 2016. 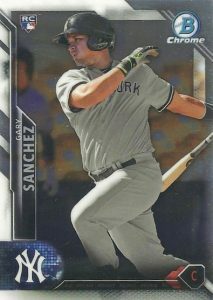 The guide below highlights all the Gary Sanchez rookies cards issued to this point. Additional options will be added. Key prospect cards for Sanchez are covered below the rookie checklist. Follow the linked card titles or images to shop for singles on eBay. Linked sets go directly to detailed product profiles. About as simple as they come, Sanchez's rookie in 2016 Bowman is plentiful and cheap. Paper parallels give collectors a chase but there are no Chrome Refractors for the young slugger in this set. 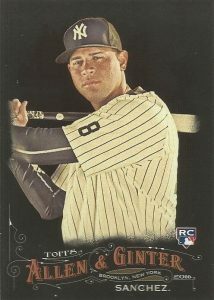 A Chrome version of this card is found in Bowman Chrome in addition to his regular rookie. 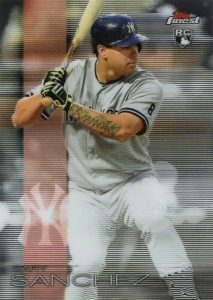 Topps doubled up on Gary Sanchez in 2016 Bowman Chrome with both a Bowman Chrome rookie and a chromium edition of his standard '16 Bowman rookie. The Chrome version of the base Bowman (#143) is exclusive to vending boxes while the main BC rookie (#90) has the regular assortment of Refractor parallels. 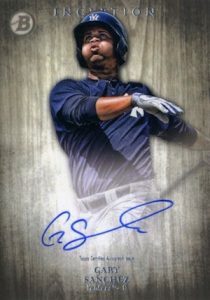 He is also featured in the Arizona Fall League insert line with two different signed options. 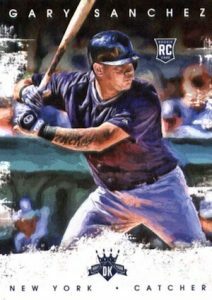 Part of the Walmart-exclusive product that seemed to pop up out of nowhere, 2016 Bowman Platinum is the place to find a more elegant base rookie for Gary Sanchez. The retail-only release adds a few limited parallels like the Orange shown below. The artistic appearance of 2016 Diamond Kings might be enough for collectors to overlook the lack of logos. Although the image is distinct, the airbrushed uniform and helmet is still very apparent. 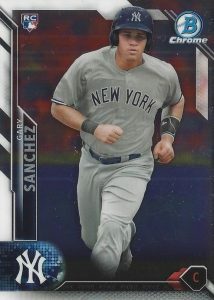 One of his most common rookie cards, 2016 Topps Series 2 is the flagship debut for Sanchez. Collectors will also likely notice that the image is recycled multiple times in his rookie card list. 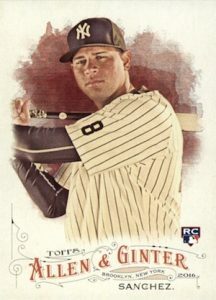 Showcasing the familiar A&G style, 2016 Allen & Ginter features both full-size cards and mini versions for Sanchez. In addition, the online-exclusive A&G X puts a dark spin on the main base card design. With inspiration from 1979 Topps, Sanchez's 2016 Archives rookie is a pretty simple affair. It is an ideal choice for budget collectors searching for an old-school vibe. 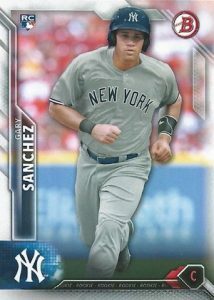 Basically Series 2 with a chromium finish, 2016 Topps Chrome is one of the more desirable low-end rookies for Sanchez. The popular brand is helped by the many Refractor parallels. 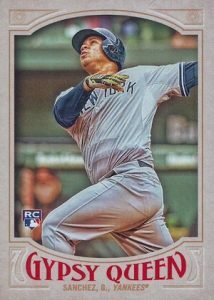 Featuring virtually the same image as Chrome, this 2016 Finest rookie card adds a tight grouping of horizontal lines to the design along with a red banner and NY logo. Also like Chrome, the various Refractor parallels are a key option for collectors. Not the strongest design by any means, 2016 Gypsy Queen mainly consists of a large frame with red text for the brand name. In addition, GQ adds mini parallels for Sanchez. 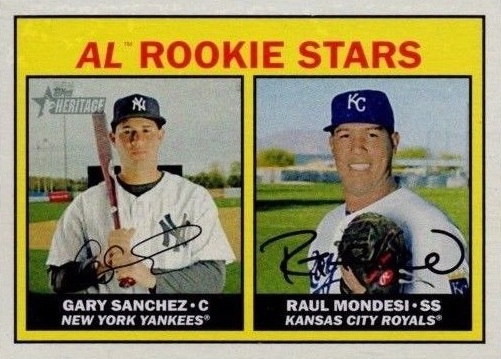 Gary Sanchez shares his 2016 Heritage rookie card with fellow rookie Raul Mondesi as part of the AL Rookie Stars subset. 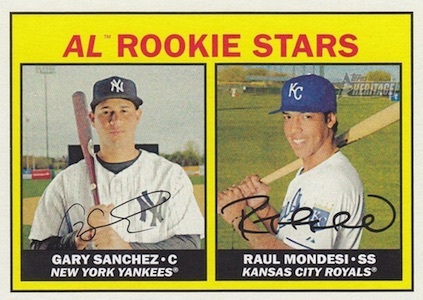 Although the intentional error has nothing to do with Sanchez, collectors can find an "error" variation that replaces the image of Mondesi with Salvador Perez. While it may not meet the exact definition of a rookie card, Sanchez is featured on several 2016 Topps Now cards with a RC logo and the game-used base relic is easily his most popular and valuable. In addition to the base, limited to 99, there are also four other parallels, numbered from 49 all the way to one-of-one. Another low-end choice, 2016 Opening Day offers the main flagship design with the only difference being the brand logo above the player's name. It is essentially a cropped version of his Series 2 rookie image. 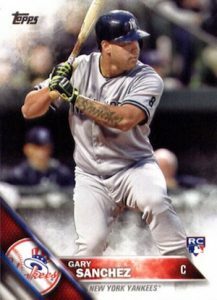 While 2016 Stadium Club is known for impressive base images, the Gary Sanchez rookie is not the strongest example. Reminiscent of a high school portrait, the main plus is that the image is at least noticeably different from the rest. 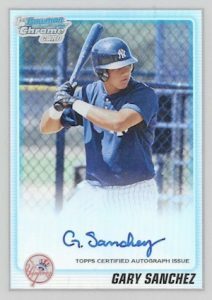 One of his earliest cards, the prospect card for Gary Sanchez in 2010 Bowman Chrome is easily among his most popular unsigned cards. 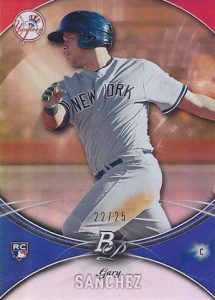 The base card is enhanced by several limited parallels including the main Refractor (#/500) shown below. 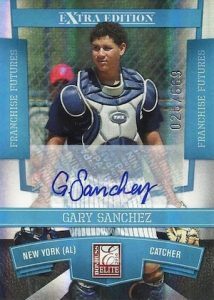 The ultimate Gary Sanchez card came many years before his MLB debut. 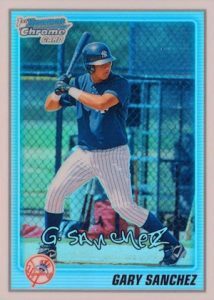 Also issued in 2010 Bowman Chrome, this signed prospect insert will remain very relevant for as long as Sanchez does. The on-card signature and Bowman Chrome brand power put it in a class of its own. Not nearly as popular as the Bowman Chrome card, 2010 Donruss Elite Extra Edition offers another early autograph for Sanchez. While the sticker autograph and cluttered design is not ideal, the card is helped by a limited base run of 669 copies. 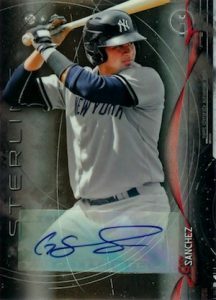 Collectors had to wait several years for another mainstream Gary Sanchez autograph card. This 2014 Bowman Inception might have come a few years after his first but stands out based on the quality look and on-card signature. Also from 2014, the sticker autograph is not the preference for most collectors, but the 2014 Bowman Sterling release is a solid signed card for a player who does not have a ton of autographed content from major sets as a prospect. How is it not a rookie card? What exactly is the “definition”? RobbyT � It’s because the Now cards are sold individually and not issued in packs. Obviously it was still included in the RC guide but not everyone considers it an official rookie.